Although this does take some time to make it’s well worth it. I don’t see why it wouldn’t be freezer friendly since some supermarkets carry chicken pot pies in the freezer section. 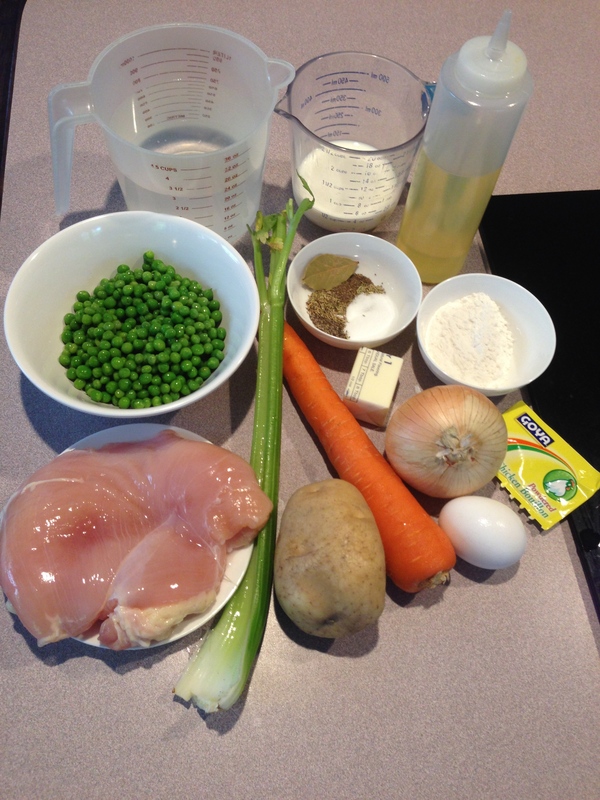 This recipe makes 12 (2 x-large muffin tin forms) individual size chicken pot pies. I really like that these are individual servings and make for a great presentation. Not only do they look appealing but taste amazing. One of these pies is very filling since each little pie is packed with vegetables and filled with a creamy gravy. Not too runny or dry. Try this satisfying comfort classic. Stir with a wooden spoon just until dough has formed and no longer sticks to the bowl; cover and refrigerate for at least 4 hours. (I recommend over night). After dough has chilled, you can start the filling. (Do not take dough out of fridge at this point, you want it as cold as possible). Fill a medium size sauce pan with water half way full; bring to a boil and add chicken, carrot, and potato; boil for 15 Minutes; remove chicken and continue cooking the carrot and potato for an addition 10-15 minutes or until tender. In a large skillet or medium saucepan heat 3 tbsp butter and couple tbsp of oil over med-high heat; add diced celery and onion and sauté until tender. Add spices and toast up for a minute or so. Then add flour and mix. Stir for about 30 seconds. Dissolve the chicken bullion cube or powder into 3 cups of water; stir and slowly add to the onion/flour mixture. Bring to a boil, whisking mixture. Add milk, then reduce heat and simmer until creamy. After sauce has reached desired consistency; turn off and pour into a large bowl to cool. Peel skins off of the carrot and potato. (Skin should come off easily). Dice chicken, carrot and potato into little bite size pieces and place in a medium-sized bowl. Remove dough from the fridge and cut into 3 equal pieces. Take one piece of dough and roll out to a 16″ by 11″ rectangle keeping remaining dough in the fridge. Cut dough in half lengthwise; then crosswise twice to form 6 squares. Each square should be approx 6″ by 6″ (it’s okay that they are square we are going to tuck and pinch the sides anyways) Roll out each square piece by an inch or so bigger so it can completely cover the muffin tin. Add 1/2 cup of vegetables into each muffin tin and 1/4 cup of gravy over the top of vegetables. Place circled dough over each filled pie and seal sides, pinching down the dough and crimping the sides to form a little pie crust. Slit the tops with a sharp knife; Place prepared pies in the fridge and refrigerate for an hour. Preheat oven to 400 degrees F. Brush egg wash over each pie and bake for 30 minutes; remove from oven and cool before serving. For the DOUGH: Combine flour and salt in a large bowl; add shredded cold butter. Cut cold butter into dough using a pastry cutter until crummy dough. Add cold water (Do not add ice cubes to dough) and stir just until dough forms. Cover and refrigerate overnight or at LEAST 4 hours. When dough has chilled. Start prepping the filling. Bring a medium saucepan filled with water (about half way full) to a rapid boil. Add chicken, potato and carrot. Bring to a boil again and reduce heat. Simmer for 15 minutes. Remove chicken and continue boiling potato and carrot for an additional 10-15 min or until tender when pierced through. Heat a large skillet or medium saucepan over med-hi heat. Melt the butter; add oil, chopped onion, and celery. Sauté until tender. Add the spices to the onion mixture and toast slightly. Then add flour and stir for about 30 seconds. to the roux. Keep whisking until creamy; add milk and continue whisking. Reduce heat and simmer stirring occasionally (about 5 minutes) until thickened. Turn off and let cool in a medium bowl. Peel and dice the carrot and potato; add to a bowl. add diced chicken to bowl and frozen peas. Mix together and set aside. Fill each muffin hole with the square piece of dough and fill each dough piece with 1/2 cup of the vegetable filling and 1/4 cup of the gravy. Repeat process with other piece of dough. Place in fridge while working with other piece of dough. Roll out the remaining piece of dough into a 17" by 13" rectangle. Cut out 12 round shapes with a cup. Roll out each circle an extra inch or so bigger. Circle should approx be 5" in diameter. Place each circle over the pies and seal tightly folding in and pinching down sides. Crimp sides and slit tops. Refrigerate about an hour. Heat oven to 400 degrees F. Brush pies with egg wash and bake for 30 minutes. Remove and cool slightly before removing. ENJOY!